Plaid Cymru MPs have joined calls for a new politics building at the University of Wales, Aberystwyth to be named after the party's first MP Gwynfor Evans. Last week, students voted to lobby officials over the issue, but a university spokesman said the process of choosing a name had not started yet. Plaid's Parliamentary leader Elfyn Llwyd has now tabled a Commons motion to support the campaign. 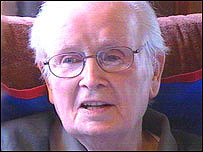 Mr Evans, Plaid president from 1945 to 1981, died last month aged 92. Mr Llwyd, who represents Meirionnydd Nant Conwy, said Mr Evans was "Wales' most remarkable politician of the 20th Century." "Gwynfor will be remembered for many things, not least for his fearless dedication to the cause of peace and international understanding. "It would be a fitting tribute for the University of Wales, Aberystwyth to recognise his achievements and legacy by naming the new politics building after him." The new building, which is currently under construction, will house the department of international politics. 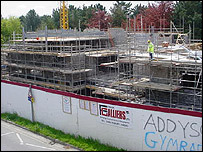 Aberystwyth's Guild of Students said a "Gwynfor" building would acknowledge the politician's achievements. Students' union president Bethan Jenkins said it was important to name the building after a figure "to inspire students who study at Aberystwyth to become a part of active politics in Wales". Mr Evans became the party's first MP in the 1966 Carmarthen by-election and helped create the Welsh language channel S4C after threatening to starve himself to death.